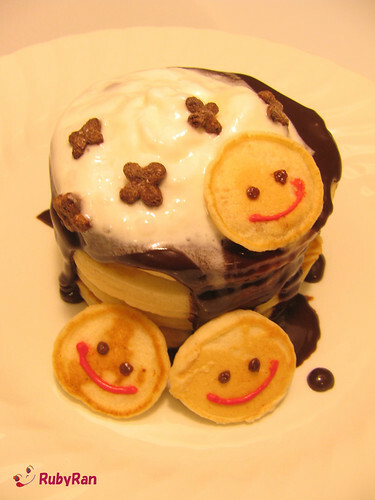 CUTE HAPPY FACE PANCAKES FROM JAPAN RESTAURANT, PANCAKE DAYS. 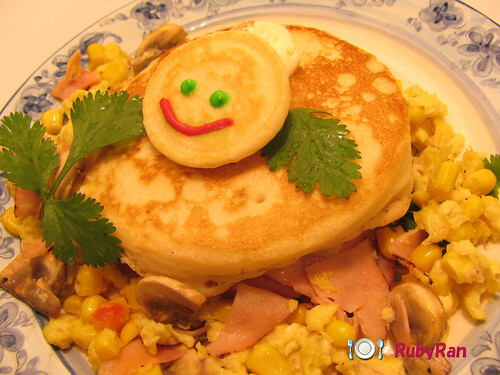 HARAJUKU BREAKFAST, ADORABLE FOOD FOR KIDS IN TOKYO. How cute are these pancakes? 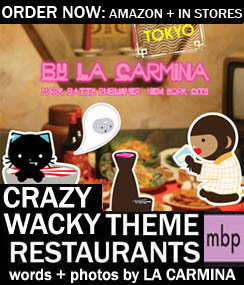 Flickr user Rubyran created them because she couldn’t go to the Pancake Days restaurant in Tokyo, Japan. – You may now preorder La Carmina’s cookbook, Cute Yummy Time: 70 recipes for the cutest food you’ll ever eat (Perigee/Penguin, October 09). It’s full of cute character recipes, including cupcakes. 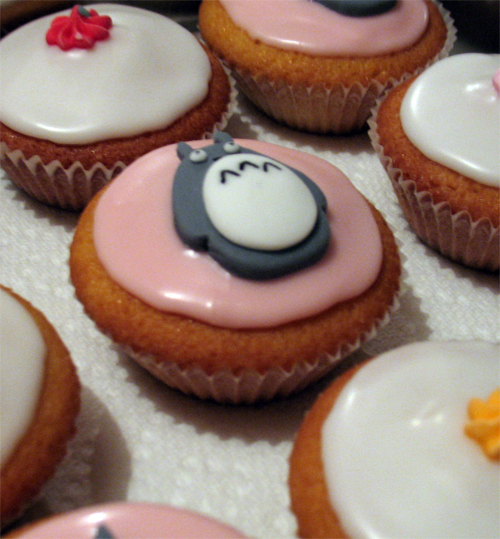 CUTE TOTORO CUPCAKES, STUDIO GHIBLI CHARACTERS MADE FROM ICING. 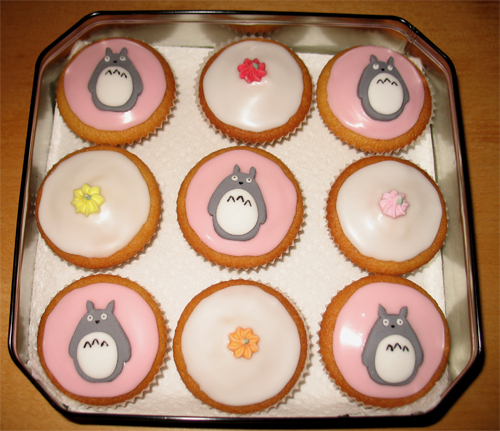 HAYAO MIYAZAKI, KAWAII CAKE DESIGNS & FUN FOOD. 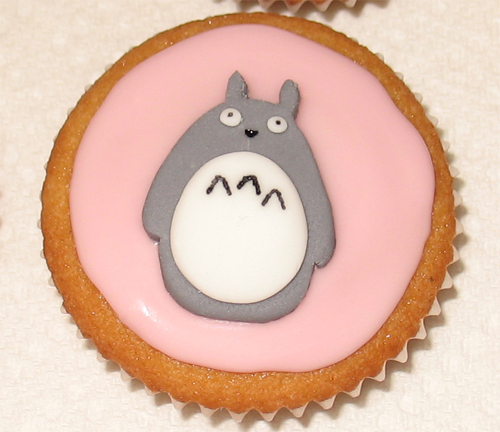 The cupcakes where inspired by our love of Totoro and all things Studio Ghibli! It was a fairly standard cupcake recipe, and the decorations were made from a template Bobi drew in Photoshop, printed out and then cut out in fondant icing (a small amount of black food coloring was added to to make gray) with a scalpel, and then the edges were smoothed by hand to give a nice rounded edge. The different layers were stuck together using a thick icing glue. The eyeballs were made by rolling a tiny ball, the pupils, nose and chest patterns were painted on in black food coloring with a toothpick! TOTORO BENTO BOX LUNCH. STUDIO GHIBLI CHARACTER BENTOS, CUTE FOOD BENTO BLOGS & FLICKR GROUPS. I’ve been posting on Flickr bento groups for 3 years, and I opened my blog 2 years ago when I realised there was absolutely nothing on bento in French. I came accross bento and cute cooking while researching on how to make sushi. I’d been packing my lunches for like, ever, so I was seduced immediately. 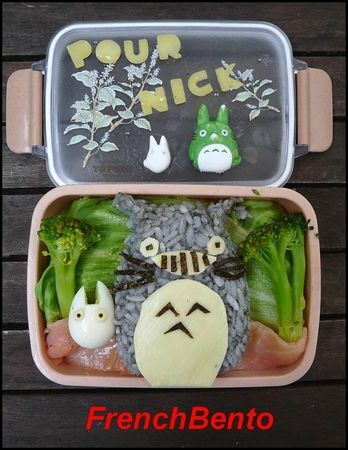 This Totoro bento was actually a surprise for a bento-friend. 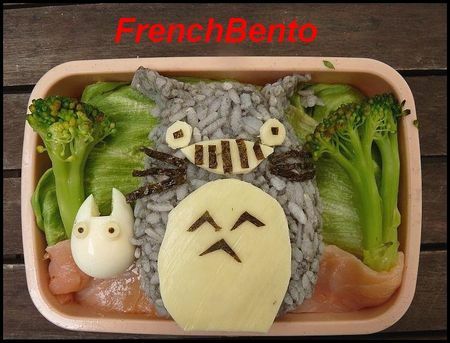 I dont usually do charaben, but this friend is a Totoro freak, and with other French bento addicts we decided to post a Totoro-themed bento on our blogs on the same day, for him. I had lots of fun doing this and making this bento. – Come hither to preorder La Carmina’s cookbook, Cute Yummy Time: 70 recipes for the cutest food you’ll ever eat (Perigee/Penguin, October 09). FUN FOOD FROM A TASTE OF HOME MAGAZINE. CUTE CAT CAKE, KID’S SANTA CUPCAKES, PIG FACE COOKIES. A Taste of Home magazine occasionally features cute food. Unlike the super-healthy recipes in my book Cute Yummy Time, these tend to be on the junk food side. Still, the cat cake and Santa cupcakes are sure to please children on special occasions. These recipes can be found on the Taste of Home website: cute pink pig face and baby mice cookies. Adorable! GROUND PORK OR BEEF SHAPED LIKE CUTE PIG’S FACE, ANTHONY BOURDAIN NO RESERVATIONS TV SHOW STILL, SEATTLE EPISODE. CUTE BUNS WITH CHOCOLATE SAUCE FACES FROM T&T SUPERMARKET, CHINA FUNNY FOOD, ASIA BREAD ROLLS DECORATED. T&T Supermarket is a small Canadian chain that specializes in Asian ingredients. Cute food is common all ove Asia – and so, the window display had fake bread rolls with chocolate sauce happy faces! JAPANESE FUNNY SNACK FOODS, RILAKKUMA CANDIES, FRIED CHICKEN FROM TOKYO CONVENIENCE STORE. 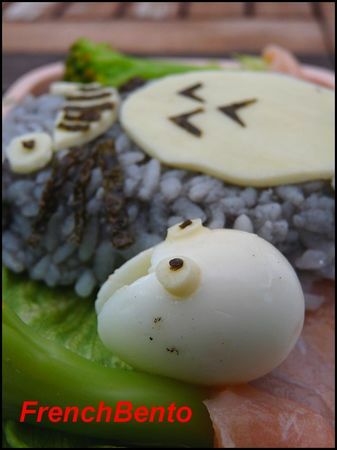 WEIRD, STRANGE, ODD, BIZARRE CUTE FOOD IN JAPAN. I love Tokyo convenience stores. They contain all sorts of cheap, strange products – like these Rilakkuma bear candies. And how about deep fried chicken… in cute-faced chicken envelopes? A little twisted, wouldn’t you say? WEIRD, CUTE JAPANESE SNACKS & JUNK FOOD FROM TOKYO SUPERMARKET: POKEMON AND ANPANMAN CURRY, HELLO KITTY, POWER RANGERS. Packaging is what sells a product, right? In a Tokyo supermarket, there is a wide selection of curry – so why not choose the one with your favorite kawaii character’s face on it? Would you pick Hello Kitty, Power Rangers, Anpanman, or Pokemon? Caramel Corn doesn’t sound very appealing to me… but the winking and lip-licking bags have got my attention! Ramen chicken flavored snacks? No thanks… not even with a plump-cheeked little boy on the bag. These are probably laden with calories, but who can resist such adorable faces? – Check out healthy desserts and snack recipes from my book Cute Yummy Time, now available for pre-order here. HAM, CHEESE, RICE BENTO BOX LUNCHES, STRANGE JAPANESE FOOD TREND. CUTEST DECORATED KID’S SCHOOL LUNCHES, GIRL’S FACE AND CARS. Slices of ham, cheese, and carrot are the perfect building blocks for making a cute bento lunch. Start with a base of rice, slice some facial features, and layer. Cute toothpicks and cutlery help keep things in place. Japanese bento lunches can be quite intricate. Rice shapers and cutter tools help reduce the work load. PS: this sample bento is made of plastic! – For plenty of creative kid’s lunch ideas and recipes, take a look at my book Cute Yummy Time, now available for pre-order here. TAKOYAKI CUTE OCTOPUS BALLS, GIRAFFE OMELET WITH KETCHUP DECORATION, SHAPED OCTOPUS HOT DOGS OR OCTODOGS WITH CHEESE MOUTH. JAPANESE CHILDRENS BENTOS. Here are some creative ideas for making cute bento lunches. Star and heart-shaped cookie cutters can be used to shape rice or cut out bread. Seaweed and cheese are great ideas for facial features, and check out the adorable octopus hotdog! I show you how to make these in my book Cute Yummy Time, now available for pre-order here. In my book, I also explain the technique of cutting baked egg sheets into animal shapes. Ketchup is a fun and yummy decoration method. Anyone a fan of takoyaki (Japanese octopus balls)? How cute is this little felt guy with an angel halo? 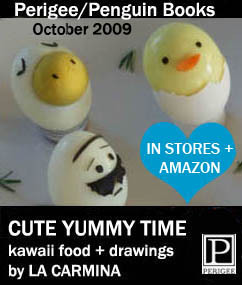 – I demonstrate these cute cooking techniques and more in my book Cute Yummy Time, now available for pre-order here.